I confess, I judge books by their covers. The minute I saw the cover of Audrey, Wait! by Robin Benway, I wanted to read it. I am happy to say that the pink-yellow-orange sunburst surrounding the girl in a black sweater and jeans (which is what I have on today, incidentally) did not disappoint. Thanks to Penguin Group for the ARC. The plot: Think of a song with a person's name in the title. "Eleanor Rigby." "Amanda." "Angie." Did you ever wonder who Eleanor and Amanda and Angie were in real life? Maybe they were the lead singer's ex-girlfriend. That's who Audrey was. Audrey Cuttler, normal high school student from California, loves loud music, indie rock, her overweight cat, and her awesome best friend Victoria. What doesn't she love? Her boyfriend, Evan. Lately it seems that Evan's been paying more attention to his band, the Do-Gooders, than to Audrey. She goes over to his house to break up with him, and as she's leaving Evan calls out, "Audrey, wait!" It's the phrase that launched a thousand hits. Evan writes a song about their breakup and calls it "Audrey, Wait!" And wouldn't you know it, the night the Do-Gooders first perform the song is the night they finally get the A&R guy from that record label to come and hear them. Suddenly, "Audrey, Wait!" is a hit and Audrey is an accidental star. Now everyone wants to dress like her, listen to the same music she does, and gossip about her. She's offered a reality show and free lip gloss. While Audrey wants to be normal and pursue a relationship with James, her coworker at the mall ice-cream shop, the papparazzi is recording everything from her trips to the record store to her makeout session with the lead singer of another band. Why you'll love it: You know what I really hate about YA lit sometimes? The endless witticisms. Who really talks like that? Although Audrey is smart and sarcastic, just what you'd expect from a girl who lives for bands like Taking Back Sunday, the dialogue never sounds like it's trying to hard to be something Joss Whedon would write, and I love it. Audrey's self-aware struggle to maintain normalcy in the face of critical Hollywood is hilarious. I also love that she has two relatively normal parents who still expect her to do the laundry and feed her cat on her way to stardom. There's a wonderfully sweet (and not just because of the ice cream) romance. Everyone lives happily ever after thanks to Audrey's grounded personality, wit, and wisdom. When you close this book, you'll feel happy and maybe turn your music up in your car and really, who could ask for more? I've been looking forward to this book since I first heard its fun concept. Yet I was a little nervous about one aspect that seems to overtake so many books dealing with pop culture. Thankfully, you set my mind at ease by saying: You know what I really hate about YA lit sometimes? The endless witticisms. Who really talks like that? Jay, to be fair, there are a fair number of witticisms in this book. But Benway has written it so they seem more natural coming from these particular characters she's constructed. She makes no bones about the fact that these characters are smart and really into music that is, for want of better words, intelligent. These are characters that I expect would be pretty sharp. And they do talk that way (especially when Audrey and James are out on dates), but I didn't find it wholly unbelievable the way I do in so many other books. I adore Joss Whedon. and his witticisms. Yet like with other things, other writers can take it just that one step too far. Kind of like fashion. And the person who wears that one extra accessory. I LOVED this book. It was wicked funny and thus entertaining. It's not something I've ever really thought about, which made it even better. This looks so good! Thanks for reviewing it and making me want it! What a clever premise for a book! And yeah, I do love that cover. 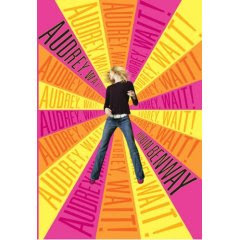 I want to know if there is going to be an actual song coming out with the title Audrey Wait? I keep hearing the song in my head and I'm curious if it will match up. I loved the book and can't wait for the author event in Pasadena at Vromans. I like the style of your review! I hope you'll consider reviewing my novel, Courage in Patience, when it is released. Please contact me if you'd be interested in receiving an ARC when they come out in August. Thanks!